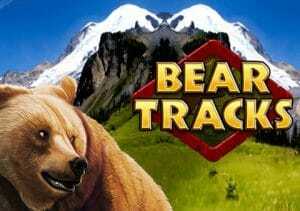 Head to the great outdoors in Bear Tracks, a fast-paced, 5 reel, 40 payline video slot from Novomatic. This nature-themed game comes with a bonus feature that awards up to 150 free spins complete with the Bear Trap feature which locks stacks of symbols in place and offers a re-spins. Play from between 40p and £80 per spin. All sorts of bears are on the loose in this simply designed, cartoon-style game – look out for koalas, pandas, black bears, grizzly bears and polar bears in this unusual snow-capped forest. The polar bear is the best bear, awarding 200 coins if you land 5 on a payline. All of them can land stacked to fill whole reels. Rounding out the symbols are Novomatic’s usual playing cards and the Bear Tracks logo which is the game’s wild. 5 wilds offer a 500 coin payout. Keep a special eye on the Bonus symbol – when this lands fully stacked in reel 1, it will be held in place and a re-spin follows. These continue as long as a new Bonus symbol lands. Fill the whole screen with Bonus symbols and you’ll trigger the Bear Tracks Free Games Trigger feature. Here you’ll be awarded 15 free spins with the Bear Trap feature active – trigger the trap by landing a stack of the same bear symbol on reel 1. Those symbols will then be held, as will any of the same bear anywhere on the reels and any wilds on show. A re-spin then follows. The re-spins continue as long as a new matching symbol hits or you’ve filled the screen. You can re-trigger even more free spins here too with a maximum of 150 free spins on offer. The volatility here isn’t as high in Bear Tracks as in some Novomatic video slots – the variance is in the medium range with a balance of payouts offered. With simple design and a classic feature, Bear Tracks is a solid if relatively unspectacular game. If you go down to the woods and trigger the Bear Trap you could still be in for a very pleasant surprise though. If you prefer more volatility, try Novomatic’s Aztec Power.